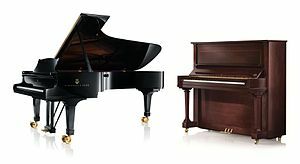 Steinway & Sons, qısaca Steinway — məşhur alman və amerikalı əl istehsalı piano istehsalçısı. ↑ Bambarger, Bradley (Yaz 2010). "Instrumental Royalty" Nəşr edən: ArkivMusic. Listen: Life with Classical Music. İstifadə tarixi: 27 iyul 2011. Fine, Larry (2007). 2007–2008 Annual Supplement to The Piano Book. Jamaica Plain, Massachusetts: Brookside Press, 13–14, 96–100, 184–187. ISBN 978-1-929145-21-8. Fine, Larry (2001). The Piano Book: Buying & Owning a New or Used Piano, 4th revised, Jamaica Plain, Massachusetts: Brookside Press. ISBN 978-1-929145-01-0. Hoover, Cynthia Adams (1981). "Journal of the American Musical Instrument Society" Nəşr edən: American Musical Instrument Society 7: 47–89. ISSN 0362-3300. (2011) The Official Guide to Steinway Pianos. Montclair, New Jersey: Amadeus Press. ISBN 978-1-57467-198-8. Matthias, Max (2006). Steinway Service Manual: Guide to the care and maintenance of a Steinway, 3rd, Bergkirchen, Germany: PPV-Medien/Bochinsky. ISBN 978-3-923639-15-1. Steinway, Theodore E. (2005). People and Pianos: A Pictorial History of Steinway & Sons, 3rd, Pompton Plains, New Jersey: Amadeus Press. ISBN 978-1-57467-112-4. Vikianbarda Steinway & Sons ilə əlaqəli mediafayllar var. Bu səhifə sonuncu dəfə 7 fevral 2016 tarixində, saat 02:58-də redaktə edilib.